We call our regular givers our ‘Support Crew’ because without their support we wouldn’t be able to operate the world class rescue helicopter service we do every day. To save just one life, the Trust needs $3,500 of community funding to meet the shortfall. Alone, it may seem like a lot, but when people come together to regularly give, it costs very little to save one life. Regular donations are the best and easiest way to make a difference. They help us plan and budget for the future and ensure our crew remain ready to response 24/7 365 days a year and helps safeguard the future of the service. Who are our support crew? Our Support Crew are the special group of supporters who chose to help keep us flying with regular donations via automatic payment. It is one of the most significant ways you can support our work because we know we can count on a constant, regular source of income – and it also makes giving easier for you! If you’d like to make one of the most powerful gifts you can and ensure we are there to help, now and in the future, we would love your support. By signing up as a regular giver, you can help to ensure that the Trust has a steady source of income. Your donations will help the most critically ill and injured in our community receive the vital care they need quickly and safely. Your regular donation can be as little as what it costs for a coffee. You determine the amount and frequency of giving; weekly, fortnightly or monthly. At your bank – simply visit any branch of your ban and advise them you’d like to make an automatic payment. Via Internet or Phone Banking – call or log on to your phone or internet banking and following the menu prompts. Once you are set up, please contact us with your details and we will make sure you receive an annual receipt so you can claim your tax rebate. 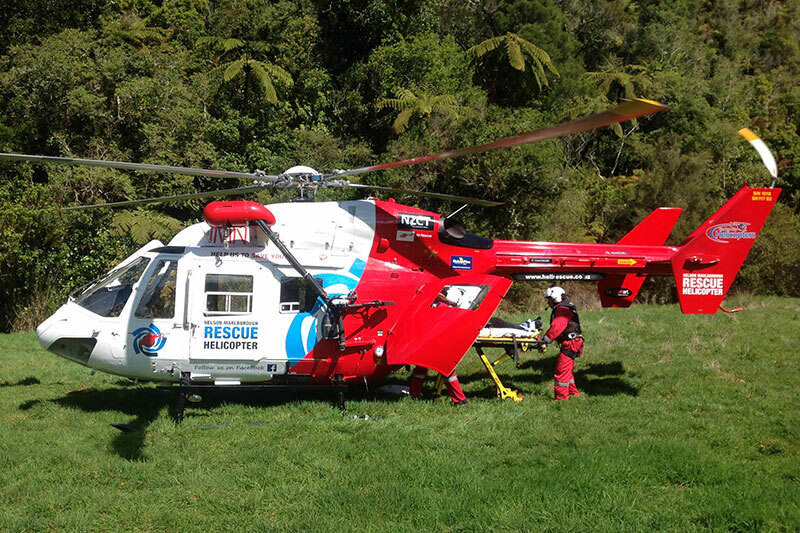 The Nelson Marlborough Rescue Helicopter Trust have operated a rescue helicopter service since 1991. This wouldn’t be possible without the support of generous local businesses. As the service gets busier, funding requirements increase and we would like your business to join other businesses to ensure we continue to have a rescue helicopter service available, free of charge, for the community. Being a Corporate Friend is a great opportunity to show your employees, customers and clients that you are a part of a service that continues to grow. Now more than ever, we need your support and contribution to provide an essential life saving service in our community. From as little as $50 per month, you can become a Corporate Friend. Placement of your logo on the ‘Tail Boom’ of the Rescue Helicopter. Branding recognition on Trust newsletter and donor brochure. Acknowledgement on Rescue Helicopter website and Facebook. Acknowledgement in The Nelson Mail during Chopper Appeal Month. Able to use the ‘Platinum’ rescue helicopter supporters logo for promotion. Framed photo of the rescue helicopter showing your Platinum support. Further sponsorship leverage opportunities are available through events. We will dedicate a mission to your business and provide feedback, story etc. Framed photo of the Rescue Helicopter showing your Gold Support. Able to use the ‘Gold’ rescue helicopter supporters logo for promotion. Framed photo of the Rescue Helicopter showing your Silver Support. 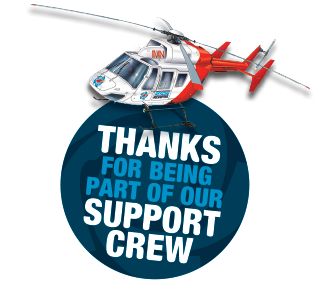 Able to use the ‘Silver’ rescue helicopter supporters logo for promotion. Framed photo of the Rescue Helicopter showing your Bronze Support. Able to use the ‘Bronze’ rescue helicopter supporters logo for promotion. To make showing your support easy, we have two payment options – monthly or annual sponsorship giving. Regular giving by automatic payment may be an easier way for your business to come on board and support the Rescue Helicopter. Please request a sponsorship form and return to us. A sponsorship invoice will then be sent for the annual amount. 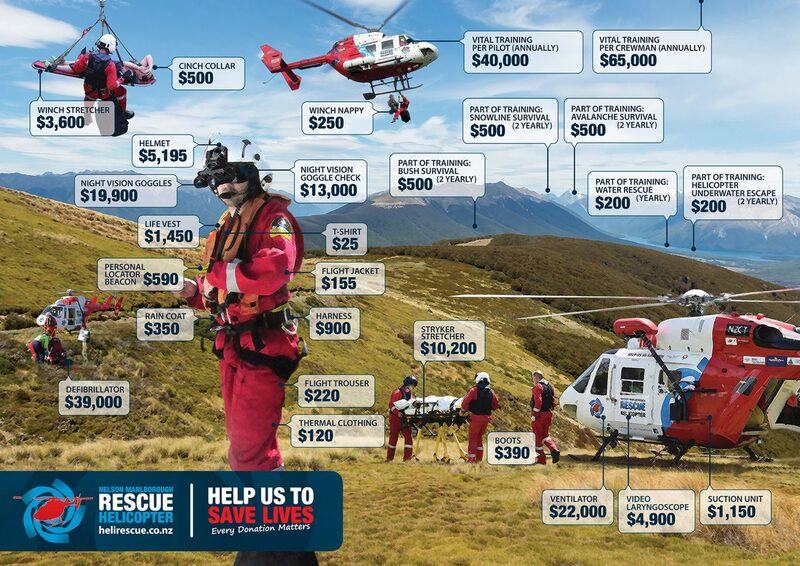 You may wish to support the Rescue Helicopter by making an annual sponsorship contribution. There are two ways you can make your annual sponsorship contribution, by cheque or direct debit. To sponsor annually, please request a sponsorship form, indicate your level of sponsorship and return to us. A sponsorship invoice will then be sent. The Nelson Marlborough Rescue Helicopter Endowment Trust provides a powerful way for you to help create a reliable and secure revenue stream, ensuring that we can plan for the future with certainty, manage unexpected financial challenges and meet essential costs such as crew training and specialist lifesaving equipment. The Trust’s funds will remain in perpetuity and be invested wisely, growing year after year with the ability to use the return on these funds when necessary. 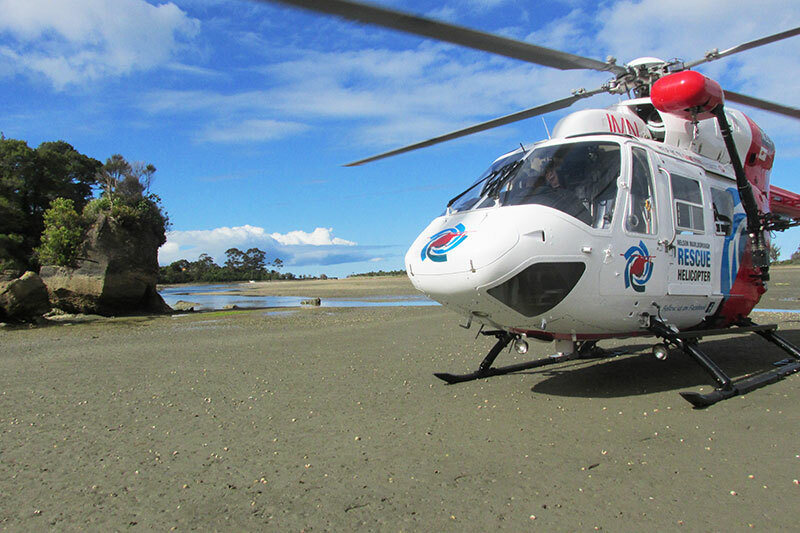 By making a gift to the Nelson Marlborough Rescue Helicopter Endowment Trust, you will be providing a lasting gift that will save lives. Make a gift of any size – you can choose to make a gift of any size to the Trust now, which will also qualify for a tax rebate of 33.3%. Leave a gift in your will – you can leave a gift in your will to the Trust by simply informing your lawyer or Will or Trust Advisor that you would like to do so. We would love to know if you have included us in your will. The way you would like your gift celebrated and the type of contact you’d like to have with us is entirely up to you and at all times we will respect your wishes in regards to privacy. Alternatively, if you would like to have a confidential chat with us about gifting to the Endowment Trust then please contact us 03 547 7278. Nine years ago Bill and Margaret Morrison chose the beauty and peace of Nelson in which to enjoy their retirement years. It’s a community they care very deeply about, and one to which they have committed vital support by making a bequest to the Endowment Trust. 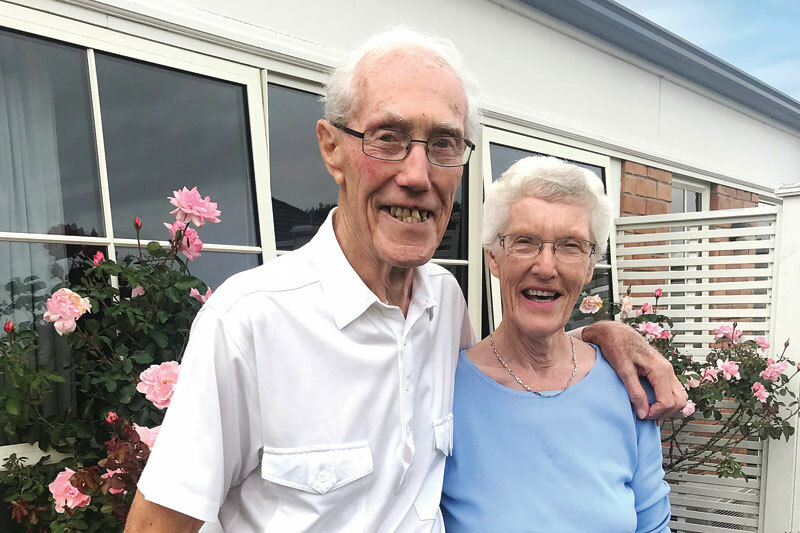 Both Bill and Margaret have had careers that involve caring for others when they are at their most vulnerable – Bill as a policeman in their homeland of Scotland and later Melbourne, and Margaret as a medical secretary at a large children’s hospital. Bill recalls his time as a policeman in the 1950’s where attending road accidents meant waiting for a GP to be called to the scene before a road ambulance might then be called for. Precious time was lost which was often the difference between life and death. It’s a far cry from the modern service the Nelson Marlborough Rescue Helicopter service provides its community, the vital service that Bill and Margaret support because they want to help save lives. Kitting out a crew member doesn’t come cheap, but it keeps them safe at all times and ensures they are ready to respond to a callout 24/7, 365 days of the year. Each crew member is clothed in fire retardant clothing and flights suits and wear appropriate safety boots chosen for our terrain. All crew have their own personal locator beacons, life vests, noise cancelling helmets and raincoats. Pilots and crew are required to wear night vision goggle to aid them to fly at night without relying on moonlight increasing helicopter safety and callouts. Medical equipment used by our Intensive Care Paramedics include a defibrillator, ventilator, suction unit, video laryngoscope and while winching utilise stretchers, winch nappy and a cinch collar. The cost of this equipment per pilot and crew person is $30,000. In addition to kitting out our crew and to keep them compliant with CAA and regulatory requirements, the Trust requires funding for vital ongoing training to ensure we provide a world-class service. The Trust must fundraise approximately $700,000 p.a. to keep our crew highly trained in to operate in our rugged and isolated environment and saves vital lives in our community. Our crew are trained in helicopter underwater escape, water rescue, bush survival, snowline survival, avalanche survival, high altitude and nigh winching, flying the wire environment, CAA competency check, night vision goggles and winch competency.